Income of a person is classified into 5 categories. Thus, income belonging to a particular category is taxed under a separate head of income pertaining to that category. 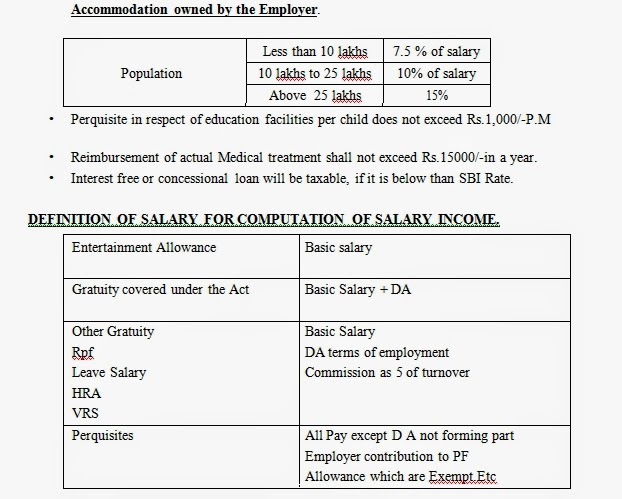 Section 14 of the Act, has classified five different heads of income for the purpose of computation of total income.All income shall be classified under the following heads for the purpose of computation of taxable amount subject to certain Exemptions’ and deductions. 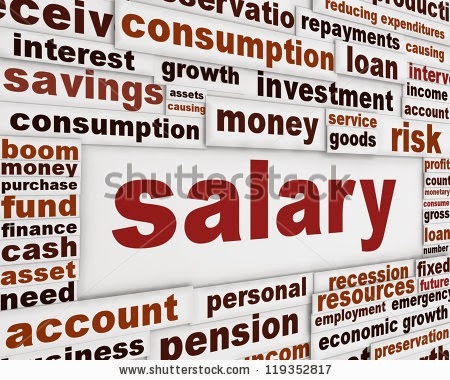 Meaning of Salary: Any remuneration paid by an employer to an employee in consideration of his services is called salaries. It includes monetary value of those benefits and facilities, which are provided by the employer and are taxable. 1.Taxable Allowances : Dearness allowance, Medical allowance, Servant allowance, Warden Allowance, Family allowance, City Compensatory allowance etc. 2.Allowances exempt upto specified limit: House rent allowances, Entertainment allowance, Certain Special allowances, etc. 3.Fully exempted allowances: Foreign allowance, sumptuary allowance to High Court / Supreme Court Judges, Allowances from U.NO. This category includes allowances which are exempt up to certain limit. If an employee is living in his own house and receiving HRA, it will be fully taxable. This allowance is first included in gross salary under allowances and then deduction is given to only government employees under Section 16 (ii). Certain allowances are given to the employees to meet expenses incurred exclusively in performance of official duties and hence are exempt to the extent actually incurred for the purpose for which it is given. These include travelling allowance, daily allowance, conveyance allowance, helper allowance, research allowance and uniform allowance. Exempt to the extent of Rs.300 per month per child for maximumof 2 children. An amount uptoRs.800 per month paid is exempt. However, in case of blind and orthopedically handicapped persons, it is exempt up to Rs. 1600p.m. Foreign allowance is usually paid by the government to its employees being Indian citizen posted out of India for rendering services abroad. It is fully exempt from tax. Allowance to High Court and Supreme Court Judges of whatever nature are exempt from tax. Allowances from UNO organisation to its employees are fully exempt from tax. Un commuted pension refers to pension periodically received by the employee. It is taxable in the hands of the both Govt. and Non Govt Employees. Commuted pension Sec.10 (10A) means lumsum amount taken by commuting the pension or part of the pension. Any commuted pension received by a Govt employee is wholly exempt from tax. Govt employee is wholly exempt from tax.